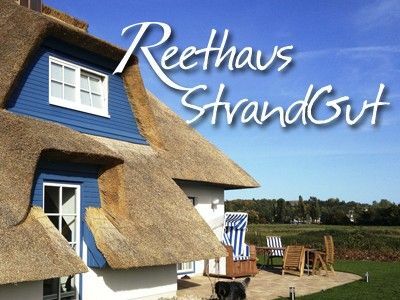 Our thatched house „StrandGut“ („stranded goods“) on Usedom is newly built (October 2012) and offers 830 square meters of land and 115 sqm of living space, plenty of space for families as well as couples wishing to have a calm and romantic time. Our holiday house, which is lovingly furnished, is located in a calm area of a small village of thatched house from where you do have a splendid view over fields towards the backwaters. There is plenty of space for max. 6 adults and one small child. The heated floor is partially out of bamboo parquet and/or beautiful tiling, with the brickwork fireside homey evenings are guaranteed and splendid meals can be prepared as the kitchen is perfectly equipped. The 3 homey and charming bedrooms with 2 king-size bed (one of 200 x 220cm) and two single bed with high-quality cold foam mattresses and slat bases plates. Your relaxing and deep sleep is important to us. One of the two comfortable bathrooms is equipped with a Finnish sauna, a rainshower and a radio in the wall outlet. Whereas the 2nd bathroom upstairs has 2 lavatories and a shower. Everywhere is plenty of space for all your personal belongings. Our holiday home does provide you with the most updated technical equipment: 2 HD flat screen televisions with internet and keyboard, DVD 3D blue-ray player and iPod docking stations as well as WiFi (16.000 DSL). We further prepared for you several books and games for all generations as well as one folder with our favourates hotspots of the island. On your large terrace with direction south-east you will find all necessary patio furniture, sun loungers as well as a comfortable beach chair and an electric barbecue grill. Because of thatched roofed houses on the island all kind of open fire is strictly forbidden. You can leave your bikes safe and dry in out summerhouse. Would you like to rent bikes? We are pleased to provide you with a bicycle dealer on the island who will deliver the bikes directly to our house. Enjoy the variety of the island Usedom encompassing unforgettable nature experiences while observing sea eagles, red kites, storks, … from our terrace. Or just relax with a glas of wine at the fireside after a long walk on the beach. All bathrooms have heated floors and heated towel rail. The bathroom on the ground floor is equipped with a Finnish sauna, a rainshower and a radio in the wall outlet. The bathroom upstairs has 2 lavatories, a separate shaving mirrors, bathroom scales, hair dryer and plenty of space for all your personal belongings and a wonderful view towards the backwaters. For children, a small step stool is available. The dining table is for 6 to 8 people. You can leave your bikes safe and dry in out summerhouse (Reetgartenhäuschen). 2 yoga mats and 1 jump rope are also available. Directly at the house there are two parking lots available. For children, there are children cutlery, children's high chair, step stool and a child-proof lock for the stairs. Pets are allowed upon request. Further available are 2 feeding dishes, a dog box and a long dog leash which, can easily be tied to the roofed wicker beach chair on the terrace allowing your dog a range of 5 m to move. You do not want to take care yourself for the firewood? Learning timely about your request we will recommend a local supplier which, will deliver the ordered firewood to the house. Smoke detectors are mainly installed in the room on upper floors. Public transport: the bus stop for line 273 (Lütow - Wolgast - Zinnowitz) is about 20 meters from our house The train station in Zinnowitz is 1 km distance. Sehr schönes und gepflegtes Haus. Wir wurden herzlich empfangen, das Haus ist auf jeden Fall weiter zu empfehlen. Das Haus befindet sich in einer sehr ruhigen Lage ganz inder Nähe vom AchterWasser was unserem Hund besonders gefiel. tolle Ausstattung, sehr liebevoll eingerichtet, perfekt! Tolle Ausstattung, alles wichtige ist vorhanden, sehr ruhig gelegen. Alles gut auch per Fahrrad zu erreichen. Wir konnten hier eine super Urlaubswoche verbringen , da es uns in diesen Ferienhaus an nichts fehlte . Alles super , vielen Dank !!! Wir haben die Odterwoche mit 2 Teenagern und 2 Hunden in diesem wunderbaren Haus verbracht, in dem es für Mensch und Tier wirklich an nichts fehlt. Die Kinder haben bei schlechtem Wetter die Sauna genossen und unser Aussie das Luxushundebett. wir haben eine wunderbare Urlaubswoche hinter uns. Am Tag sind wir gelaufen, gelaufen, gelaufen. Fast 100 km haben wir in der Natur geschafft. Das Haus, der Service, die Abrechnung....es hat gestimmt. Wir kommen gerne wieder und freuen uns auf den nächsten Urlaub. Das helle und lichtdurchflutete Haus bietet alles, was das Herz begehrt: Eine äußerst stimmige Inneneinrichtung, eine super ausgestattete Küche, großzügige Schlafzimmer und Bäder, Kamin und Saune - dazu die ruhige Lage, der reibungslose, freundlich-unaufdringliche Übergabe-Service bei Ankunft und Abreise.... Das berühmt-berüchtigte Haar in der Suppe haben wir jedenfalls nicht finden können. Alles in allem: Sehr empfehlenswert!!! In addition to the white Baltic beaches and the old seaside architecture, Usedom offers many recreational facilities such as seawater baths, a butterfly garden (Trassenheide), farms and craft shops (beach chair manufactory Heringsdorf), climbing parks, museums and a number of cultural and children's activities. Highlights besides the Amber baths are the imperial baths and the other resorts on the Baltic Sea located at the inland lakes of the island (freshwater lakes) such as Schmollensee, Gothensee or Wolgastsee. In the hinterland, you can discover the small town Usedom, some villages with castles (Mellenthin, Stolpe Castle) as well as some salt huts and windmills (Benz, Pudagla, Trassenheide, Kamminke), the old lift bridge Karnin, the peninsulas Lieper angle and Gnitz that frame the backwaters, and Peenemünde . Also popular are cycling tours on the island, both in the hinterland (along the aft water) as well as on the coast. Thatched houses do stamp the image of the island. From our holiday house “StrandGut” you can start your bike ride along the aft water or sit on our large terrace in beach chair traditionally manufactured in old Heringsdorf. In the long-term average 1917.5 hours of sunshine per year were measured on Usedom. This record was documented over 30 years by a station of the German Weather Service located in Zinnowitz (northwest of Usedom). Handtücher und Bettwäsche sind im Preis enthalten. Der Stromverbrauch wird für die Mietzeit verbrauchsabhängig ermittelt und mit 30,-cent pro Kwh gesondert in Rechnung gestellt. Diese liegen in der Regel zwischen 15-25€ pro Woche. Die Kurtaxe wird vor Reiseantritt direkt an den Vermieter überwiesen. Ihnen steht die Nutzung des Internets über 2 HD-Fernseher sowie über WLAN (16.000 DSL) zur Verfügung. Hierzu ist eine Nutzungsvereinbarung in schriftlicher Form zu treffen. Bettenwechseltag: Sonntag. In der Nebensaison können gerne andere Absprachen getroffen werden. Sie erwartet eine persönliche Betreuung mit Hauseinführung vor Ort.